New York long was a product of the harbor economy. Before there was a Times Square or a Grand Central Station, Lower Manhattan, then ringed with docks, was oriented to the railroads and factories of the Jersey coast to its west and the merchants and manufacturers of Brooklyn across the East River. The decline of Lower Manhattan as an economic engine is in large measure a reflection of the fall of that harbor economy as first Manhattan and then its partners in Brooklyn and Jersey City de-industrialized. Still, there’s cause for optimism. In the last two decades, the old harbor economy of trade and industry, severed by the collapse of manufacturing, has been re-knit on the basis of the service economy. By the middle of the 1970s, even as New York was at its nadir, the growth in service sector jobs began to exceed the decline in manufacturing jobs. And despite the impact of 9/11, New York continues to attract the key element of the modern economy, talented people; college applications are up for next year. One sign of New York’s vitality is that so many places want to be considered the city’s ‘sixth borough’ --- Fairfield County, Conn., Jersey City and even Philadelphia. This dispersion has brought both opportunities and challenges to New York itself. My optimism has been tempered by two questions and a frightening possibility. 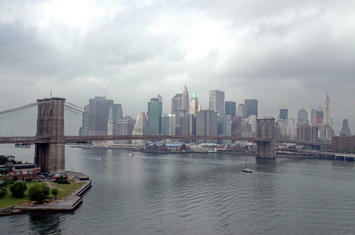 First, attempts to accommodate all the interest groups has slowed the entire rebuilding of Lower Manhattan. Second, the Bloomberg administration --- for all its posturing about rebuilding downtown --- continues to focus as well on expanding the far west side of Manhattan and downtown Brooklyn as well as various new stadia. With a recession already underway, one that is centered in part on the critical financial industry, it would seem more prudent for the city to narrow its priorities. Perhaps a better focus would be to seek how to revive the harbor economy first envisioned by ironmaster and former Manhattan mayor Abraham Hewitt, the son-in law of Peter Cooper, and the corporate lawyer and anti-Tammany reformer Andrew Haslett Green. Their vision was one of a vast united city united by new bridges across the East River as well as a rebuilding program for the city’s crumbling docks, streets and transit facilities. In the late 19th Century, basic infrastructure and opportunity were inextricably intertwined. The upshot was extraordinary. New York became “the engineers’ city.” New York City bonds were issued to build bridges across the Harlem and East Rivers, and tunnels under the Hudson connecting New York to New Jersey as well as the subway system that became the city’s circulatory system for labor. These tied Brooklyn and Lower Manhattan together into a single economic unit. With this New York became not only the largest city in the U.S. but its busiest port, a paradise for small manufacturers and a headquarters city for national corporations. New York’s consolidation also promoted a rapid expansion of the urban area. Even at a time when centralization seemed to be in the saddle, the wildly crowded and extraordinarily expensive downtown began to shed some of its functions. Given the extraordinary cost of land, those who stayed increasingly worked in skyscrapers like the Woolworth Building, which opened in 1913. In the 1920s, even as New York surpassed London as the world’s financial center --- a designation that may not be reversing again --- the functions of the downtown were narrowing. The opening of Penn Station in 1910 gave Long Island and New Jersey easy access to midtown. It helped set off a real estate boom in Times Square, which was intensified three years later when Grand Central Station opened. The Holland Tunnel followed in 1927. Not surprisingly in the 1920s most new construction was in midtown, a trend that continued even into the depression years when Rockefeller Center was built, with midtown beginning to eclipse Lower Manhattan. While midtown grew, the port thrived; in the 1920s half of U.S. export and import traffic moved through the harbor. Eighty-five percent of the traffic landed on the New York side and then had to be moved across the Hudson on “lighters.” This was the so-called “Manhattan Transfer.” The problems of cross-harbor traffic were magnified by the control exerted on both sides of the harbor by the local political machines. As a response harbor congestion during World War I --- at one point trains were literally backed up to Pittsburgh --- the new bi-state Port of New York Authority turned very effectively to constructing the Lincoln Tunnel and the Outerbridge, Goethals, George Washington and Verrazano bridges linking New York to New Jersey by car and truck. By 1950 New York had it all, including a vast and varied manufacturing sector, the largest port and undisputed dominion over the financial, cultural and media life of the nation. In the early 1970s the harbor economy fell apart. Even though the financial sector grew, the fastest growth was in government workers engaged not in basic city services but rather in social services and make-work health care jobs. Between 1960 and 1975 spending tripled in constant dollars, while the city population was declining slightly. The money went to public assistance, health social services and housing. Redistribution rose from 26 percent of NYC expenditures in 1961 to 36 percent in 1969 and has stayed at about one-third. This change in economic character transformed New York from a city that fared well in recessions to one more susceptible to wide swings in employment and growth. Taxes rose, city services deteriorated and businesses fled. The city, of course, is in much better shape today, largely due to the reforms of mayors Koch and Giuliani and some favorable trends in the global economy. New York is clearly a better place to live and work than it was just two decades ago. In part, the decline of manufacturing finally began to pay off for New York. De-industrialization, a disaster for some sections of the city, had been an opportunity for others to upgrade their quality of life by turning manufacturing lofts into living spaces. Old manufacturing districts like SoHo became “funky.” First, they attracted artists who were soon followed by Wall Street yuppies. New York became a magnet for twenty-somethings, a dating bar for young college graduates. Brooklyn also is bustling with business and shopping districts, with a wave of gentrification beginning in the brownstone neighborhoods of Park Slope, Carroll Gardens and Fort Greene. With the nexus between Manhattan and Brooklyn restored --- intertwined by the best mass transit connections anywhere in the county --- the chance to reinvent the great harbor economy is better now than any time in fifty years. Instead of turning its back on the harbor that created and sustained the city or centuries, the future depends, in large part on n turning the waterfront into an asset. It’s beauty and recreational possibilities can make downtown into an attractive live-work location. And then there are the extraordinary possibilities presented by 172 acre Governors Island, a five-minute ferry ride from either Lower Manhattan or Brooklyn’s Red Hook, Governors Island, with its golf course, playing fields and historic buildings. The future of the city once again will depend on capitalizing on the waterfront. Born a harbor city, New York can be reborn once again as a city the lives and thrives on its waterways --- if the city can decide that this again represents its priority for the future. We will probably have to wait for a Mayor with a name other than Bloomberg for that process to start. Fred Siegel is a Professor of History at Cooper Union in New York. Submitted by alexmargarate on Mon, 09/09/2013 - 04:16.